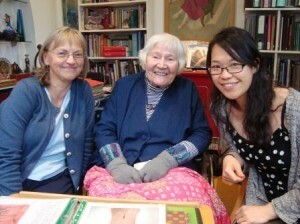 First-year student Geraldine Sim and I recently visited Karen Finch OBE at her home in Walthamstow. Karen, who is now in her 90s, has an international reputation as one of the founders of modern textile conservation. She set up the Textile Conservation Centre (TCC) at Hampton Court Palace in 1975. After Karen’s retirement in 1986 the TCC continued at Hampton Court and subsequently became part of the University of Southampton. The TCC closed in 2009 and its resources (equipment, intellectual property etc) were used to establish the Centre for Textile Conservation at the University of Glasgow, the successor to the TCC. Geraldine is the current recipient of the Karen Finch Bursary, which was established by the Textile Conservation Foundation some years ago to honour Karen’s huge contribution to the field. 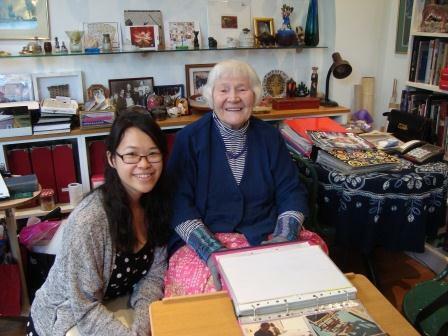 Karen trained and worked with textile conservators from all around the world, so is particularly delighted that a student from Singapore is benefitting from the award named in her honour. Geraldine was thrilled to meet Karen and to find out more about the early days of textile conservation – she was surprised to find out just how far the profession has moved on since the 1960s when the idea of documenting object treatments was still novel. Karen began her conservation career at the Victoria and Albert Museum and was very interested to see Geraldine’s pictures of her summer placement there. She is delighted that the Centre in Glasgow is going from strength to strength and is continuing the tradition established by the TCC for excellence in teaching and research. It was wonderful to read about Karen Finch and the work that she has done. It is thanks to her that we are all benefiting. Thanks for your comment Toolika, and for expressing a sentiment felt by so many of us.